Should I Replace My Heating System This Fall? We still have a few weeks of hot weather to go before things finally begin to cool off. That means that you still need to be keeping a sharp eye on your air conditioner for any developing problems. There are all kinds of ways that an air conditioner could begin to malfunction under the strain of daily use. We’re not going to cover all of them here, but we can go over some of the most common problems to afflict air conditioners during the summer. Refrigerant is the catch-all term for a variety of different fluids, one of which is used in your air conditioner. The air conditioner evaporates refrigerant in the indoor unit to absorb thermal energy from the air in the ducts. It then condenses the refrigerant in the condenser coil outside to vent the heat it previously collected. The air conditioner uses the same refrigerant throughout its life that it received when it was first installed. If a leak develops in the refrigerant line, it can very quickly start to cause problems for the system. As the refrigerant is drained from the air conditioner, the system’s ability to cool the home will lessen. At some point, the air conditioner will be unable to continue operating with the amount of refrigerant left in the system. Make sure that you call for repairs as soon as you notice fluid dripping from the system, especially if it’s accompanied by a drop in output. If your air conditioner seems to turn itself on and off every few minutes, then it’s probably short cycling. Short cycling is a problem often caused by an electrical issue in the system, though there are other issues that may contribute to it. The immediate effect of short cycling is to severely hinder the air conditioner’s ability to cool the home. This is because the system is unable to complete a full cooling cycle, which is the basis for its cooling ability. Long term, though, short cycling starts to really substantially harm the air conditioner. A short cycling air conditioner wears out much faster than it would normally, due to the added stress placed on it by the unusual rhythm. Short cycling air conditioners need repairs much more frequently as a result. If left alone long enough, short cycling can shave a few years off the end of an air conditioner’s life. The air handler is the part of the air conditioner responsible for circulating air throughout the home during operation. If the air handler malfunctions, the system won’t be able to properly cool the home. 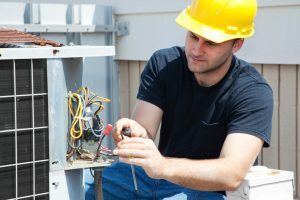 If your air conditioner seems to be having trouble blowing cool air, or any kind of air at all, it might be because the air handler isn’t working properly. Call for repairs to find out for sure. Douglas Cooling & Heating provides comprehensive air conditioning services throughout Jefferson County, AL. If you need help with your air conditioner, contact us today to schedule an appointment.